As technology platforms and paradigms shift, morph and ultimately change how we interact with our devices and workstations, gaps between old and new widen while innovative ideas have room to take root. To turn the light onto those emerging companies, SD Times is pleased to again present its Companies to Watch in 2015. These are startups or young companies working on projects that help fill those gaps or take us to entirely new places. Some of these companies might grow into the next Amazon or Google. Some might find a niche and thrive quite nicely for years. Others, unfortunately, won’t gain traction, or the platforms beneath them will change and derail their efforts. Be that as it may, for now, in this moment, these are the companies our editors are recommending you keep your eye on. Are you watching these companies? Have we missed any, in your opinion? 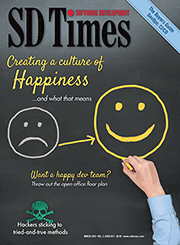 Write us at feedback@sdtimes.com. Why We’re Watching: In only a year, the open-source platform for natural language IT automation grew its community to more than 800 contributors and became the most popular IT automation project on GitHub. Ansible Inc., the company behind the open-source juggernaut, has turned Ansible into a serious competitor to Chef and Puppet in the IT orchestration, application deployment and configuration-management space. Why We’re Watching: It’s a Linux distribution for modern infrastructure stacks. By providing an OS for running thousands of servers, CoreOS has positioned itself at the crux of innovation for scalable server infrastructure. With its recent acquisition of Docker hosting startup Quay.io, CoreOS is also hedging its bets in the booming container market by launching its own private Docker repository. Why We’re Watching: Facial recognition may be the flashier buzzword, but facial coding technology is less controversial and far more marketable. MIT Media Lab startup Affectiva has developed Affdex, software that reads facial expressions to measure a customer’s emotional connection with an ad, media content or brand. The opt-in emotion measurement has far-reaching implications for marketing and advertising, and the Affdex mobile SDK is already putting the technology in the hands of developers. Why We’re Watching: Whether wearables end up a fad or grow into a lasting market, there’s no denying the technology is still in its infancy—and far from a natural experience for end users. Finnish startup Augumenta aims to change that with the Augumenta Interaction Platform, an SDK integrating gesture control and touch-based projection of keyboards and interfaces into smartglasses. The tech isn’t yet released, but Augumenta showed off the immersive AR experience with live demos on Google Glass and Epson Moverio at the Wearable Tech Expo.